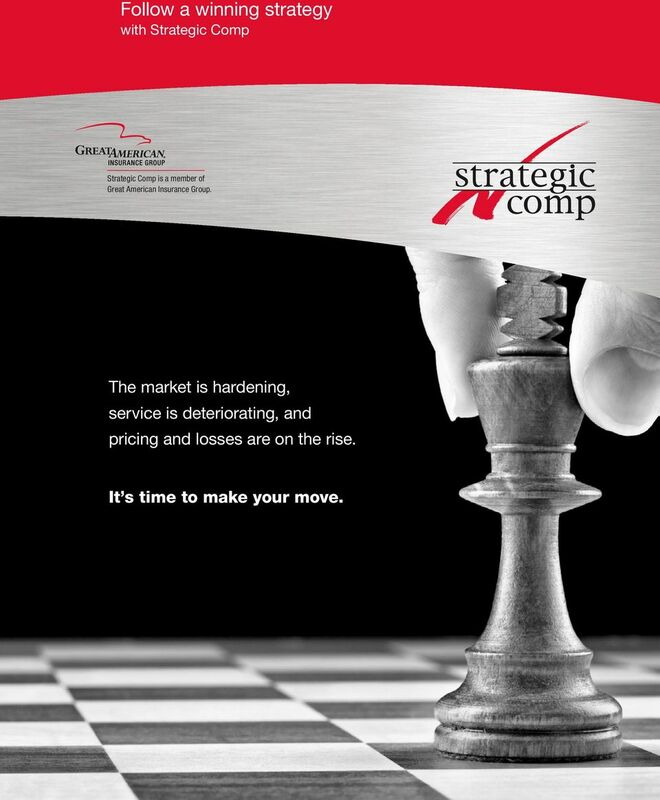 Download "Follow a winning strategy with Strategic Comp"
1 Follow a winning strategy with The market is hardening, service is deteriorating, and pricing and losses are on the rise. It s time to make your move. 2 make the right move At, we believe that workers compensation is a controllable expense. Since 1992, we have enabled our clients to As a Risk Management partner, combines a unique financial structure and a dedicated service team that recognize our customers for good performance. 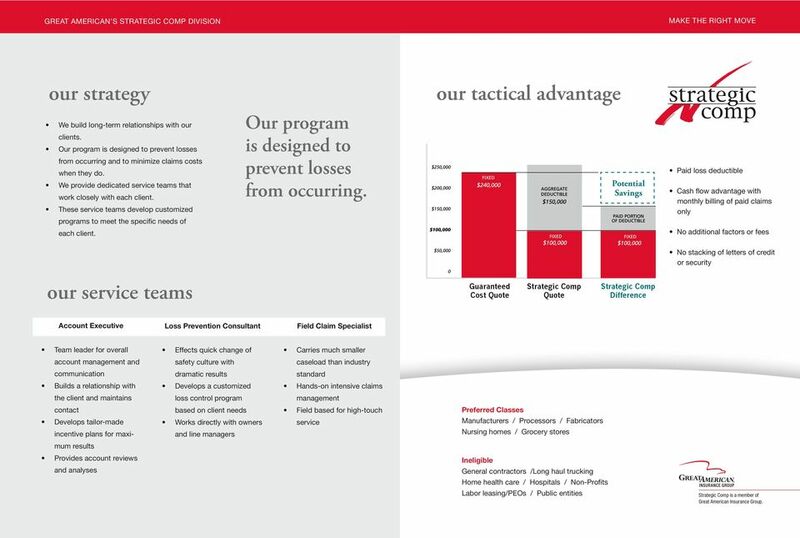 Our Service Teams include a Loss Prevention Consultant who works with our clients to develop customized loss control measurably reduce both losses and expenses by offering a unique approach to workers compensation. The model offers a competitive alternative to guaranteed cost programs for accounts paying over $150,000 in annual premium. 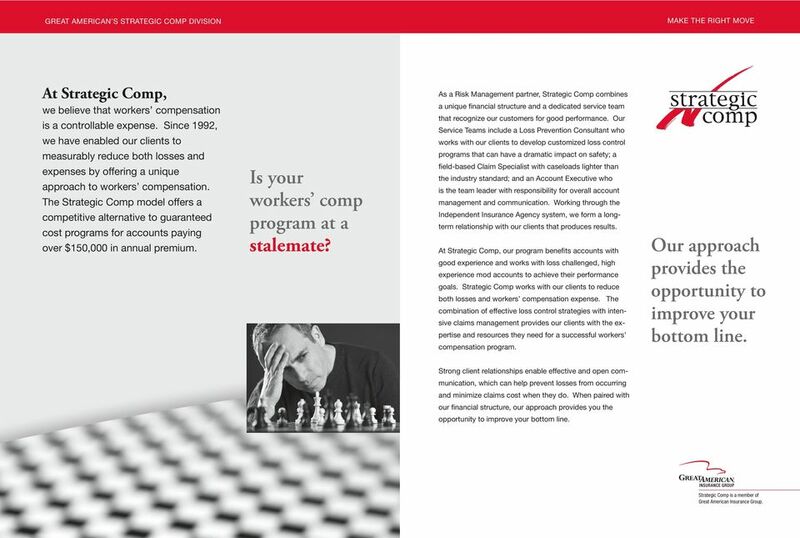 Is your workers comp program at a stalemate? programs that can have a dramatic impact on safety; a field-based Claim Specialist with caseloads lighter than the industry standard; and an Account Executive who is the team leader with responsibility for overall account management and communication. Working through the Independent Insurance Agency system, we form a longterm relationship with our clients that produces results. At, our program benefits accounts with good experience and works with loss challenged, high experience mod accounts to achieve their performance goals. works with our clients to reduce both losses and workers compensation expense. The combination of effective loss control strategies with intensive claims management provides our clients with the expertise and resources they need for a successful workers compensation program. Our approach provides the opportunity to improve your bottom line. Strong client relationships enable effective and open communication, which can help prevent losses from occurring and minimize claims cost when they do. When paired with our financial structure, our approach provides you the opportunity to improve your bottom line. 4 make the right move our gameboard WA MT ND ME is proud to work with a national network of independent insurance agents who represent our products and services to our commercial customers. Please contact your local commercial insurance representative and ask about. For more information, contact the professionals at to plan a winning strategy for your organization. OR ID WY SD MN WI MI NY VT NH MA CT RI contact CA AK NV AZ UT NM CO NE KS OK TX IA MO AR LA IL MS IN KY TN AL PA OH MD WV VA NC SC GA FL NJ DE Kimberly Gunn / TN, AL Karen Wise / GA, SC Byron Sinclair / IL Michael B. 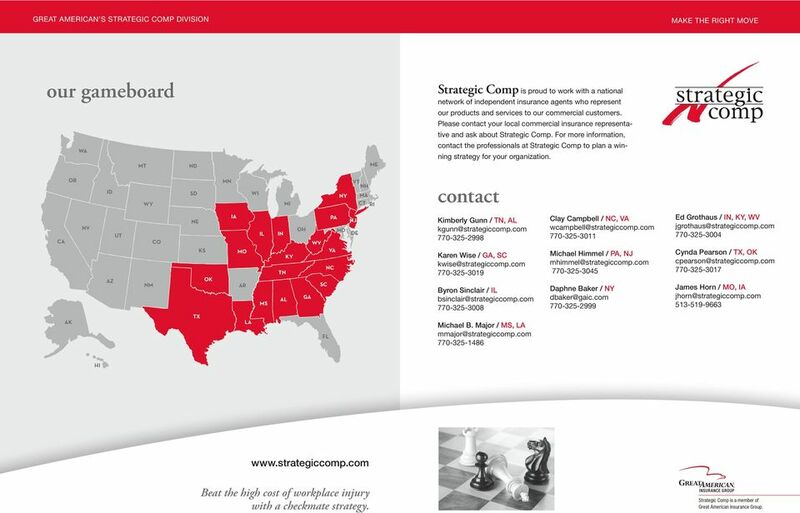 Major / MS, LA Clay Campbell / NC, VA Michael Himmel / PA, NJ Daphne Baker / NY Ed Grothaus / IN, KY, WV Cynda Pearson / TX, OK James Horn / MO, IA HI Beat the high cost of workplace injury with a checkmate strategy. Federation of State Boards of Physical Therapy Jurisdiction Licensure Reference Guide Topic: License Renewal Who approves courses? Workers Compensation Experience Mod In Your Control or Out of Your Control? Who provides this training? Are there any requirements? The parents/guardians and the doctor go through the medication curriculum with the student. When Medicare-Medicaid enrollees lose their Medicaid coverage: Who loses it, for how long, and what are the consequences? Moving TIM from Good to Great? 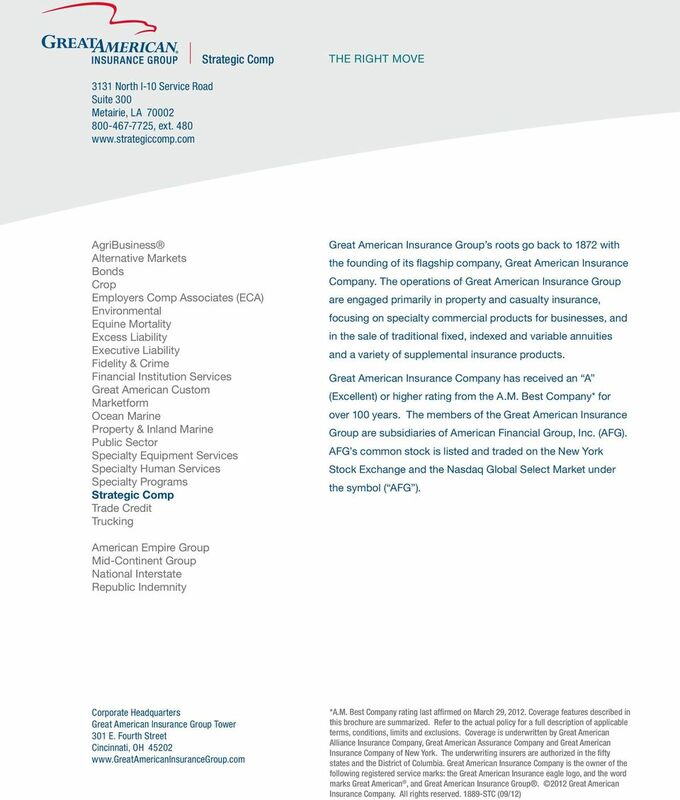 American Equity Investment Life Insurance Company Bonus Gold (Index 1-07) PFG Marketing Group, Inc.
= This information has been updated by the state department of insurance. What does Georgia gain by investing in its colleges and universities 2 A tremendous return: More economic prosperity. Less government spending. A stronger competitive advantage. A higher quality of life. FOCUS. Health Reform. Health Insurance Market Reforms: Rate Restrictions JUNE 2012. Overview. What are rate restrictions? GE Inventory Finance. Unlock your cash potential.